Mukesh Ambani-led Reliance Industries Ltd (RIL) is picking majority stake in diversified media and entertainment group Network18 in the biggest deal in the Indian media sector. This marks the culmination of the multi-tier deal originally struck two years ago, where, in the first leg, the group had bankrolled Network18 promoters to buy Eenadu with convertible debt. RIL said its board has approved infusion of up to Rs 4,000 crore into Independent Media Trust (IMT), a unit under Reliance Industries, for the acquisition of control in Network 18 Media & Investments Limited (NW18) including its subsidiary TV18 Broadcast Limited (TV18) and the open offers to be made consequent to the acquisition. 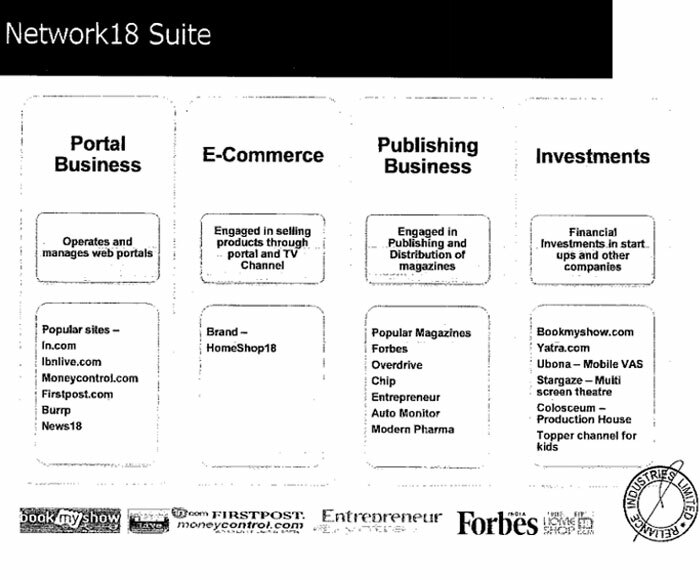 NW18 is the owner of a suite of premier digital internet properties, e-commerce businesses and broadcast content. IMT would use the funds to acquire control over NW18 and TV18 resulting in ownership of about 78 per cent in NW18 and 9 per cent direct stake in TV18 (besides having control through NW18) besides acquiring shares from the public shareholder of the companies. The deal would also trigger open offer for a small listed firm of the group Infomedia Press Ltd.
"This acquisition will differentiate Reliance's 4G business by providing a unique amalgamation at the intersect of telecom, web and digital commerce via a suite of premier digital properties. This suite includes In.com, IBNLive.com, Moneycontrol.com, Firstpost.com, Cricketnext.in, Homeshop18.com, Bookmyshow.com; the broadcast channels include Colors, CNN IBN,CNBC TV18, IBN7, CNBC Awaaz," RIL said on Thursday. The announcement came after market hours but stock investors had some inkling of the deal as both NW18 and TV18 scrip shot up over 10 per cent in intra-day trades. NW18 shares ended the day at Rs 45.15 a share, up over 7 per cent, while TV18 scrip ended at Rs 34.95 a share, up 2.5 per cent on the BSE in a weak Mumbai market on Thursday. NW18 as a group ended FY14 with total consolidated income of Rs 2,692 crore with net loss of Rs 36.77 crore as against total income of Rs 2,382 crore with net loss of Rs 105.45 crore the previous year. This follows a swift top deck movement at NW18 early in the day. The company's COO Ajay Chacko and CFO RDS Bawa resigned on Thursday, following the company's chief executive B Sai Kumar who quit the firm a day earlier. This indicates Reliance Industries is looking at a total overall of the top management of the media group as it gains control of the media group. As reported earlier by VCCircle, RIL getting control of NW18 was a natural corollary of a deal struck two years ago which allowed Raghav Bahl to remain in management control of NW18 with an option to get majority stake through a convertible debt. Raghav Bahl-led NW18 Group had struck a deal to acquire a string of regional language news besides general entertainment TV channels under Eenadu Group owned by RIL for up to Rs 2,100 crore($395 million then) in January 2012. RIL, that had quietly picked a large stake in the Eenadu Group and had it kept that under wraps till the disclosure of the NW18-Eenadu deal, indirectly funded this acquisition by bankrolling the promoter group firms through equity convertible debt. Under that deal, TV18 approved the acquisition of 100 per cent stake in regional news channels in Hindi namely ETV Uttar Pradesh, ETV Madhya Pradesh, ETV Rajasthan and ETV Bihar and ETV Urdu channel besides 50 per cent stake in general entertainment channels ETV Marathi, ETV Kannada, ETV Bangla, ETV Gujarati and ETV Oriya and 24.50 per cent in ETV Telugu and ETV Telugu News. TV18 got board and management control of ETV News Channels and ETV non Telugu entertainment channels. It had approved an outlay of up to Rs 2,100 crore for this acquisition. Additionally, TV18 had an option to buy the balance 50 per cent interest in ETV non Telugu GEC Channels and additional 24.50 per cent interest of ETV Telugu Channels, held by RIL Group. To fund the acquisition, both NW18 and TV18 approved rights issue to the tune of up to Rs 2,700 crore each. Network18, being the promoter and holder of majority equity in TV18, was to subscribe to about Rs 1,400 crore in the rights issue of TV18 "therefore, once this subscription amount was netted out, the net aggregate rights issue of both NW18 and TV18 was to result in a fund raising of about Rs 4,000 crore. The contribution of the current promoter entities of NW18 in these twin issues was about Rs 1,700 crore. Besides subscribing to their full portion, the promoters also reserved the right to subscribe to any unsubscribed public portion of the rights issues. It is here that RIL came into the picture to indirectly fund the transaction. Raghav Bahl entered into an arrangement with RIL' trust IMT to secure the funding required for this purpose. Bulk of the promoters contribution to the rights issue came from this trust that subscribed to optionally convertible debentures of the promoter entities of the NW18 Group. So even as RIL had the right to pick a major stake in NW18 group firms in the future, Raghav Bahl as founder and promoter, continued to retain management and majority stake in both NW18 and in TV18 (through NW18). TV18 utilised the money to repay the existing debt, funded the acquisition of ETV Channels besides its working capital needs. NW18 utilised the funds raised to repay the existing debt and subscribe to the rights issue of TV18. RIL, through investments of about Rs 2,600 crore, by its group companies, picked stake in various ETV Channels operated and managed by Eenadu Group including 100 per cent economic interest in the regional news channels, 100 per cent economic interest in ETV non Telugu entertainment channels besides 49 per cent economic interest in ETV Telugu Channels. It is not clear exactly when RIL made these investments. While Blackstone initially cut the size of the deal, it later completely pulled out of the transaction after facing delays in securing a green signal from government authorities to complete the transaction. Thereafter, Nimesh Kampani of JM Financial Group had reportedly acquired a stake in Eenadu. RIL had apparently acquired the economic interest in the media group from Kampani. The deal will implicitly strengthen the balance sheet of NW18 as a group with a cash rich RIL becoming its direct promoter. It can strike big deals to drive consolidation in the media sector and also generate synergies in the new media segment with RIL's upcoming broadband push. For RIL, one of India's most valued companies, the latest transaction comes as yet another business diversification from its core energy business. The firm that earlier ventured into retail sector and over the past two years has gone pretty aggressive with entry into hospitality(strategic interest in Oberoi Hotels promoter EIH Ltd), financial services(JV with DE Shaw) and broadband (Infotel) among others. Even as oil & gas sector remains at the core of the company (and its cash cow in the near future), with the latest business diversifications RIL is slowly transforming itself into a conglomerate with diverse businesses. The group had been building a strong content pipeline for its upcoming 4G broadband service under Reliance Jio Infocomm (formerly Infotel Broad Band Services Limited). It had previously entered into a Memorandum of Understanding with TV18 and NW18 for preferential access to all their content for distribution through the 4G broadband network being set up by Reliance Jio. As per the MoU, Reliance Jio has preferential access to the content of all the media and web properties of NW18 and its associates and programming and digital content of all the broadcasting channels of TV18 and its associates on a first right basis as a most preferred customer. RIL expects digital content from entertainment, news, sports, music, weather, education and other genres will be a key driver to increase consumption of broadband. The deal, though already well known in media circuits, would shake up the sector in the country. The media sector has been grappling with dwindling ad revenues from the mainstay print media and cut throat competition in the television broadcast space. It would also create the strongest competitor to Jain family controlled privately held media behemoth Bennett Coleman & Co Ltd, the company behind top media brands such as The Times of India, The Economic Times, Times Now, Filmfare, ET Now and Radio Mirchi among others. Another interesting aspect would be the repercussion for the digital media business. RIL's retail arm had been talking about starting an online channel marking its entry into e-commerce, however HomeShop18 (which is on its way for a NYSE listing) could now be the channel to push through the e-com vertical instead of building another online retail property. Mukesh Ambani Network18 Group Reliance Industries Ltd.